Soybean cyst nematode on soybean roots. Samples submitted through the Minnesota SCN sampling and education program originated from 28 Minnesota counties, with the majority of the 363 samples coming from the most newly infested northwest region (Figure 1). 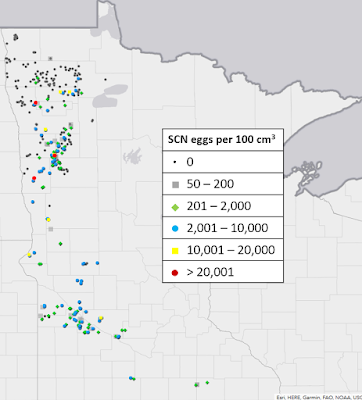 While 49.6% of samples had SCN population densities below the limit of detection of 50 eggs per 100 cubic cm of soil, the remaining 50.4% tested positive. One sample submitted through this survey included the first documented infestation in Beltrami County. 43% had egg densities high enough to cause some yield loss on SCN susceptible varieties. 45% had egg densities high enough to cause yield loss even on SCN resistant varieties. 7% had egg densities so high that soybean yields would be impacted enough that planting soybeans would not be recommended (2). Research has shown that when SCN is present at moderate densities, planting resistant soybean varieties can improve soybean yields by more than 40% (3-6). Using Minnesota’s average yield of 50 bushels per acre and an average soybean price of $9.10 per bushel, the value of SCN management after a detection could be as high as $182 per acre, or $29,120 on a 160-acre field. What are participating farmers saying? In a follow-up survey of those who submitted soil samples, only 8% of respondents had previously routinely submitted soil samples for SCN analysis and 44% had never. Twenty-six percent of respondents were not previously aware that their field(s) were infested with SCN and for 21% the SCN population density was much higher than anticipated. As a result of this SCN sampling program, 91% indicated that they were extremely likely or likely to continue to periodically collect SCN soil samples. As a result of learning their sample's SCN egg counts, respondents plan to actively manage SCN with 47% planning to plant a soybean variety with SCN resistance and 29% planning to plant a crop that is not a host of SCN. 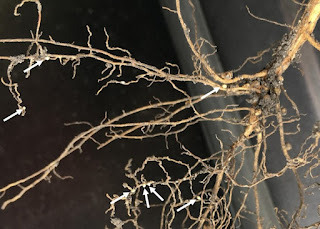 Soybean cyst nematode (SCN) is a microscopic root-infecting worm that is the most yield limiting pathogen of soybean, responsible for annual yield losses of more than 95 million bushels in the North Central US (1). Because above-ground symptoms tend to not be diagnostic or obvious, yield-damaging populations of SCN may be present long before producers are aware that a crop is at risk. 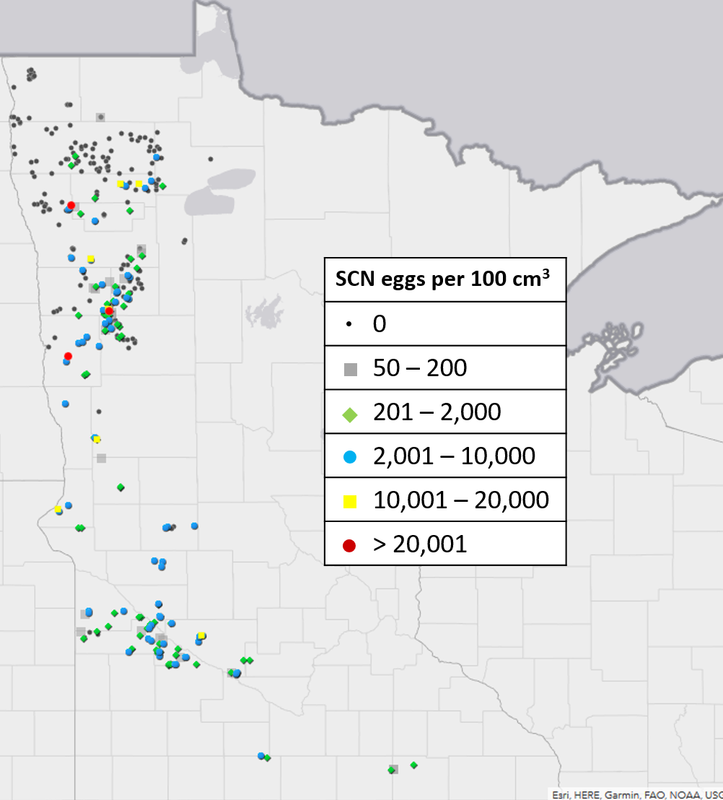 While Extension personnel, agronomists and other agricultural professionals repeatedly stress the importance of monitoring and managing SCN to maximize soybean production, many producers remain unaware of the threat that SCN poses or how essential monitoring population densities is to maintaining crop productivity. This program began in 2018. With funding from the Minnesota Soybean Research & Promotion Council (MSRPC), University of Minnesota Extension personnel developed a Minnesota SCN sampling and education program. Its goal was to increase awareness regarding the threat that SCN infestations pose to soybean yield potential and encourage SCN sample collection. While farmers were responsible for sample collection and shipping, costs associated with sample analysis and education were covered by check-off funds. 1. Bradley, C.A. et al. 2017. Soybean Disease Loss Estimates from the United States and Ontario, Canada - 2015. Crop Protection Network. 2. Chen, S. (ed.) 2011. Soybean Cyst Nematode Management Guide. UMN Extension. St. Paul, MN. 3. Donald, P.A. et al. 2006. Journal of Nematology. 38:76-82. 4. Kandel, Y.R. et al. 2017. Plant Disease. 101:2137-2143. 5. Wang, J. et al. 2003. Plant Disease. 87:623-628. 6. Wheeler, T.A. et al. 1997. Journal of Nematology. 29:703-709.